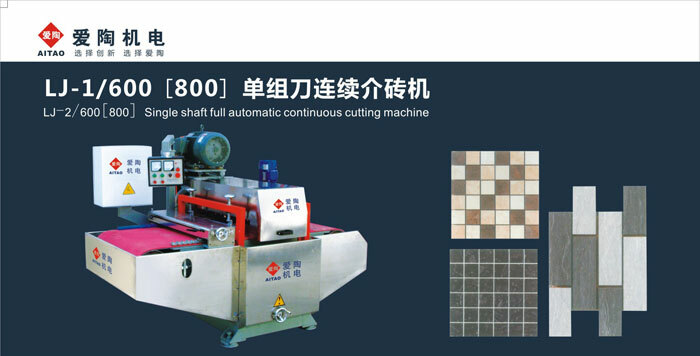 LJ-1/600 (800) single set of knives continuous referral brick single set of knives consecutive referrals brick product is suitable for floor tiles, the stone split or required of the bar, square brick, capable of processing tiles with different width. Processing width 25-600 (800) mm. With homemade plate can be cut 10X10 mosaic, machine design is reasonable, high precision machining, cutting efficiency, precision, production advantages. Headstock bearing seat using water-cooled device, it continuously for a long time with no heat, not high temperature, to extend the service life of the bearings. "V"-shaped belt guide to ensure precision conveyor belt. The dovetail groove lift, double support gantry structure. Cutting more stable, vibration is smaller.